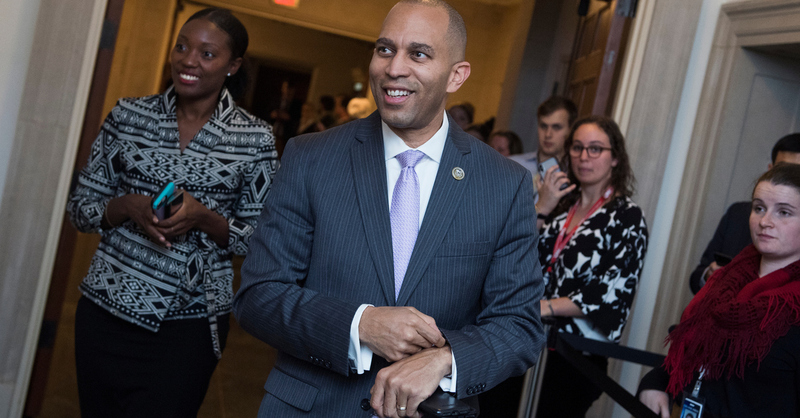 Rep. Hakeem Jeffries (D-N.Y.) has been elected Democratic caucus chair after edging past a fellow member of the Congressional Black Caucus (CBC). In a 123-113 vote, Jeffries, one of the leaders of the party’s messaging arm, defeated veteran Rep. Barbara Lee (D-Calif.), a former CBC chairwoman. Jeffries, 48, is seen as a rising star among House Democrats and potential future Speaker. He frequently appears on the cable news shows to advance the Democrats’ message and push back against the GOP agenda. But following his victory, Jeffries told reporters he wasn’t thinking about his future political ambitions and instead was solely focused on the task at hand. Jeffries will now preside over the rest of Wednesday’s leadership elections, which include picking a nominee for Speaker. With Rep. James Clyburn (D-S.C.) expected to easily become majority whip, that means there will be two black lawmakers serving in the top five leadership positions for the first time in history.